I started this painting like I start all my paintings. I make a few layers of marks with several colors. Then I start looking to find what appears to me in the painting. Lately, all I’ve seen are flowers. Flowers everywhere. I think this is because I’m getting closer to going to Maui for two months. Maui is filled with gorgeous colors and beautiful flowers. When I first became ill, my life as I knew it ended. I laid in bed for over 15 years with no diagnosis. I did nothing except go to doctors when able. When I finally got a diagnosis of lyme disease, I got treatment and some of my life returned. Not a lot, but more than I had. I believe that my constant faith in God (although there were some challenging times about that) and my ability to pick myself up and be positive and practice staying positive got me back to living. My life is still very limited, but I’m extremely grateful I live only a five-hour flight from Maui. I can do sitting on an airplane. I collapse once I get there. But, I’ll have plenty of time to recover from the flight this year. In 2012, through an odd series of “coincidences”, I took a painting class from Flora Bowley. A very good friend at that time, tricked me into signing up for Flora’s eclass. I was very sick with fibro, lyme and CFS. I had been in bed for over 20 years. I was kind of doing art. But I was just too sick to do much. Making a phone call overwhelmed me. Trying to be creative was impossible. Then, I discovered the computer app I now use, Painter. At that same exact time, Flora came into my life with her philosophy of life and art. 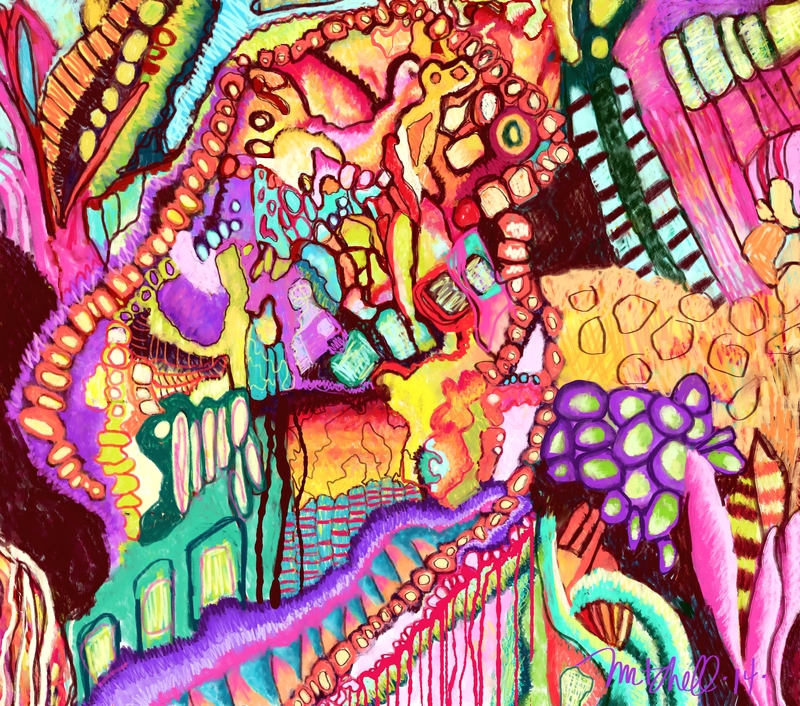 I had a positive outlook on life, but it had never occurred to me to apply that to my art. Duh! Flora has shared stories of her students in her blog. This week, she chose my story. Click here to read the blog. While you’re there, check out her fantastic art and be sure to check out her classes. Be sure to click on “Shop” at the top. She has fantastic products made from her art for sale. Flora’s art or her classes make fabulous Christmas gifts. I’m so excited. About two weeks ago, I discovered that art bloggers were doing blog hops. Blog Hops are where one artist blogs about his/her art, and then asks three other artists to talk about their art in their blogs. The lyme has flared back up. Apparently general anesthesia, which I recently had, can cause this to happen. I had been feeling very despondent about this, because I am very sick again. So this has come at a really good time for me. There are four questions I am to answer as part of this blog hop. The first question is: What are you working on at the present time? 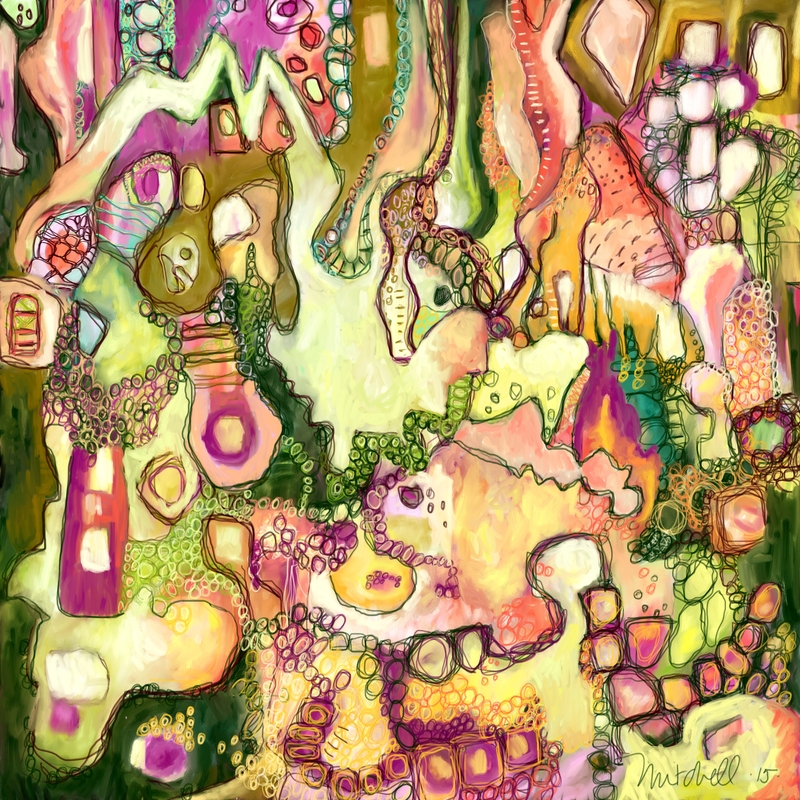 I have just finished this painting, called Wonderland. I took my first painting class from Flora Bowley in September, 2012. I have been painting ever since. 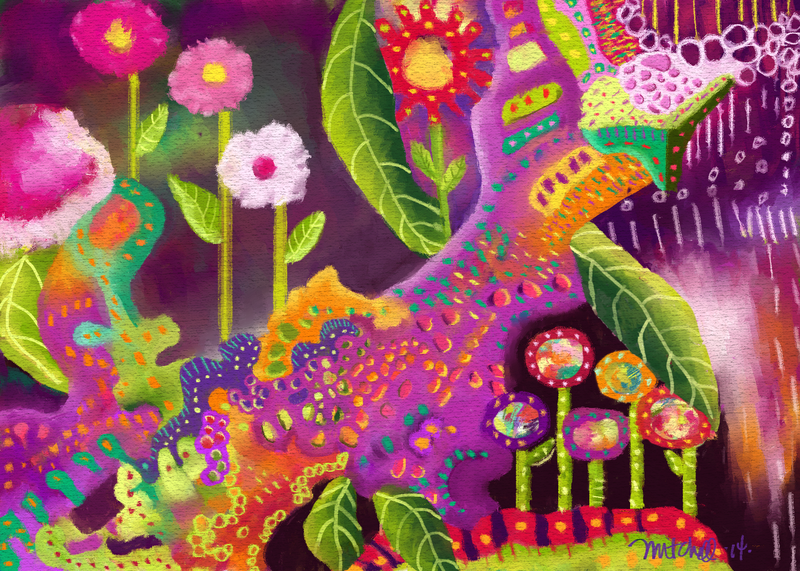 As most of you know, I paint digitally. Since I took Flora’s class, I have been working very hard to get my paintings to look like what I see in my mind. I have been pouring over other people’s work looking for help and inspiration. I look at work by Flora, students of Flora’s, Kandinsky, Van Gogh, Matisse, Klee and many others. I want to paint as the big kids do. I made progress and I was starting to see the light at the end of the tunnel in Peace at Last (posted here) and another painting. But they were still not quite what I was trying to get. There was just not enough going on in the paintings. With this painting, I feel like I finally started to get what I wanted. I finally got a painting to do what is in my head. This is a huge break-through piece for me. To me, Wonderland is freer and has depth. I know I have a long ways to go, but I’m very encouraged. I’m starting to really have a lot of fun painting. The second question is: How does my work differ from others in this genre? 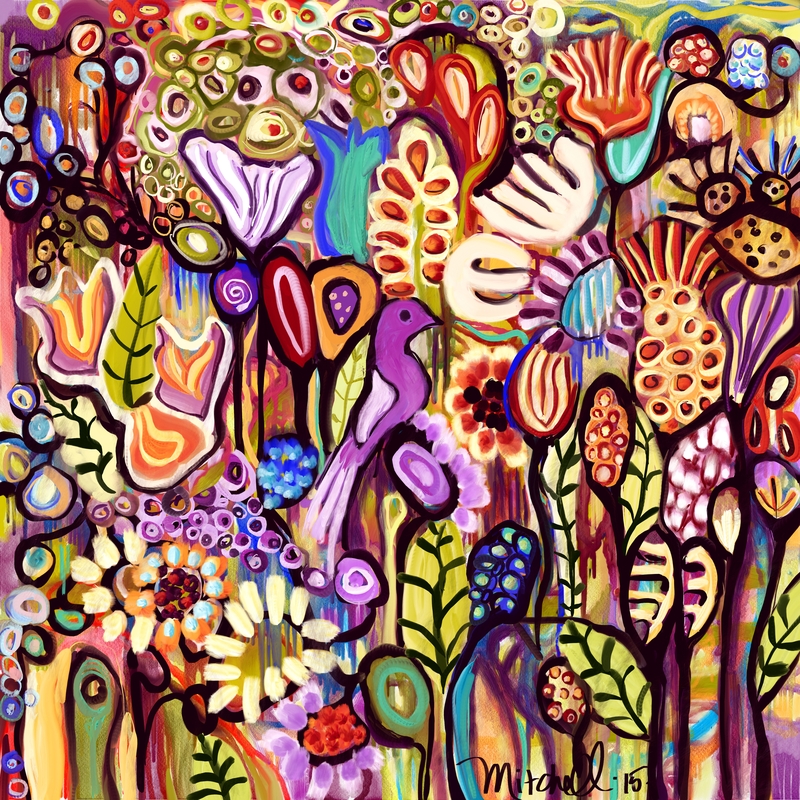 Flora Bowley calls her students the Bloomers. 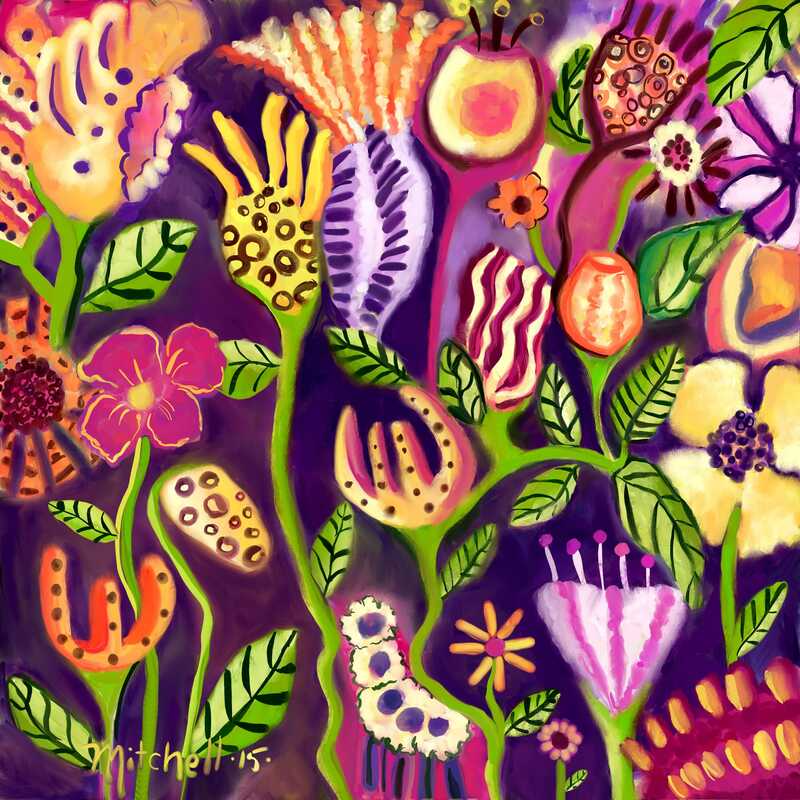 I really like the way Flora and many of her students paint. However, in many of the student paintings, there is a tendency to pretty much copy almost exactly what Flora does. People use the same exact symbols and color combinations she uses. I decided that one thing I don’t want to do is have someone look at my work and say, “Oh, yeah, she took Flora’s Bloom True class.” I want my work to reflect the unique creative person I am. The next question is: Why do you create what you do? I have FM/CFS/lyme and spend about 75% of my time in bed. I had been a textile artist prior to becoming ill in 1994. Then, I no longer was well enough to do textiles. I thought I could no longer do what my soul wanted to do. Then, I found out I could paint on the computer in bed with a Wacom tablet. Being able to paint again and be creative has filled a hole in my soul. I am driven to create. It is like I don’t have a choice. For some reason, God wants me painting. I hope that it brings joy to others. The last question is How does your creative process work? While I work on a painting, I stay focused on that painting. I work only on it. When I paint, it takes me away to a very special place. When I can find that place, then I can tap into what makes me creative and makes me feel very good. I work in layers. I start out with just throwing paint, pastels, whatever on the canvas. I build up the layers of paint and marks, to hopefully give the end painting a lot of interest. This is the part I have been struggling with so much. I think I touched it in this painting. I have chosen three other artists I admire to carry on blogging about their art. I hope you will check out their pages. All three of these women are wonderfully creative artists. I recently met a new friend on Facebook. Her name is Yanik Falardeau. You can see her art Facebook page, here. She and I seem to have connected on a spiritual level. We seem to share many of the same beliefs. She recently posted this quote from Harvey Fierstein, an American playwright and actor. I love this quote, it sums up how I feel. I do believe in putting good out into the world. And I believe in taking care of each other. In physics there is an explanation for how matter is all connected together. Spiritually, I have always believed that we are all connected. I believe that when one of us throws a pebble in the water, it can turn into a tidal wave in someone else’s life. We can do this either by an action or our words. That is why I believe very strongly in staying positive, no matter what. It can be a hard thing to do, stay positive. I used to be a very negative person. But since my early 30’s, I have been practicing being positive. I am very careful about the words I use. I watch closely how I say things. I don’t want to contribute negative or hurt in any way out in the world or in my own life. To sum up, I believe exactly what Harvey said above. That there is a God, that this God connects us all together, and that what I do with my connection to you, can have an affect whether I intend this affect or not. 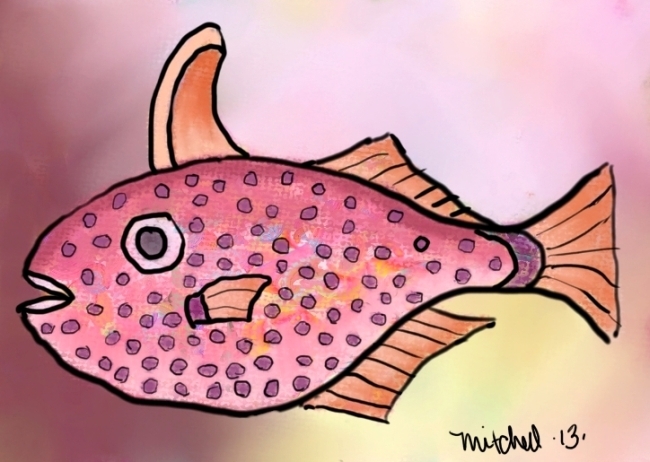 The art is a fish from one of my Sea Life paintings.